For an audio recording of this interview, click here. 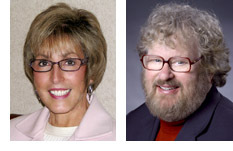 Cathleen Norris and Elliot Soloway are both pioneering educators who are defining the future of technology and learning. Dr. Cathleen Norris, a former high school teacher for over 14 years, is currently a professor in the Department of Technology and Cognition at the University of North Texas. Cathleen is also the past president of ISTE and the past president of NECA, the organizing body for the country’s leading technology and education conference, NECC. Dr. Elliot Soloway is a faculty member at the University of Michigan. In addition to teaching at the university, Elliot is involved with a number of grant initiatives for the development of middle school science instruction through technology. His research also involves working with many different school districts to define technology-based curricula. Together Cathleen and Elliot have authored and published over 100 different research papers on a variety of different learning technologies through the professional organization the Association of Computing Machinery (ACM). They are also founders, partners and collaborators of the handheld software company, GoKnow. Late in 2008, I had the opportunity to interview Cathleen and Elliot on their thoughts regarding mobile technologies and this platform’s ability to deliver educational content to students. Scott Traylor: Cathleen, Elliot, could you share with us how your university work and the work you are involved with at your company, GoKnow, have influenced your thinking regarding technology use in the classroom? Elliot Soloway: Well, Cathie and I have worked together for about 15 years. A bunch of years ago we took on the task of trying to understand why is it that technology has not impacted K-12 education in the same way that it’s impacted basically every other aspect of human endeavor. We conducted a survey called the “Snapshot Survey” and as we went into that survey we thought, “Oh it’s going to be something about the teachers. There’s something about the teachers that’s problematic. If we can just figure out what that problem is, then we could address the issue of why computers and technology have not yet had an impact in the classrooms.” What we found in the survey results was that the issue was about access and wasn’t about teachers at all. It was about the fact that there was such a limited amount of access. 65% of the classrooms had one computer or less in their classroom. We found 60% of the kids were spending less than 15 minutes a week on a computer because there weren’t enough computers or there weren’t any computers. So why hasn’t technology had an impact on K-12? It’s because there hasn’t been enough technology available, so the kids couldn’t use it. And if they couldn’t use it, they certainly weren’t able to learn from it. That was a startling realization. The fact that it is about access was sort of a necessary condition. Cathleen Norris: In the survey that Elliot was talking about, we surveyed more than 10,000 teachers across the country; from Santa Clara, California to Florida, to New York. We had a really good mixture of teachers. When we found out there was this access problem, we decided that if we were going stay on this path we’re on, which was to provide laptops to all students as the solution to the access problem, then the technology solutions we were looking to achieve were simply not going to happen. The amount of laptops needed, and we were talking about 55 million children in the United States public schools at the time, was a solution that just didn’t scale. Elliot and I didn’t really believe that this was the right answer to the technology access problem. So five years or so ago Elliot was in a meeting with Roy Pea, a leading professor on education at Stanford University. Shortly after this meeting, Elliot called me and said “We’ve got to start developing for the Palm computer.” This was just after the Palm first came out. He said “Roy’s convinced me this is a real computer.” At that time we were working on an NSF grant. We decided to take what was left of that money and try to develop educational applications for the Palm. In other words, let’s take this low cost, easy to use businessman’s device and retrofit it so that it could be used in schools. During that summer we had a group of very bright and enthusiastic undergraduate students working with us. We asked them to help define what Elliot called the “cool dozen apps.” We talked to teachers about what kinds of things they did in the classroom and what kinds of ideas the students had for what they would want if they were students in those grades. We didn’t quite come up with twelve apps but we did come up with and develop quite a few. Almost immediately we had more than a hundred thousand downloads of these apps once we offered them online for free. The only problem was that after Palm changed their operating system, our apps didn’t work on the new Palm operating system. People started calling us saying we have to redo these apps so that they work on the new operating system. We said “Excuse me but free is free and we are professors. This is not what we do,” but these calls continued to come in. We thought that maybe we could hire a programmer, one of the original people we worked with us on these apps, and maybe we can just fix this problem. Anyway, long story short, we ended up spinning a company out of the University of Michigan. We licensed the applications from the University and then started to maintain them. This was the very beginning for us in doing anything other than our professorial work. This was how we got into the software business. ES: Traditionally NSF gives out all this money to researchers. Researchers publish papers, and that’s really great, and they get their tenure and such, but really nothing happens. At the time, NSF was asking “How do we transition research into commercial ventures?” So basically what Cathie and I did was do what NSF wanted; to take the research and make it real. Now we were naïve in the sense that we could easily start a business. No big deal, right? The University of Michigan was very supportive and helpful as we started it. I was the CEO thinking “No problem!” We had absolutely no marketing. We thought people would simply call us up, we’d answer the phone, and we would send off the software. We really had no idea how to do this as a real business. After a while, people started helping us because they realized what we had was valuable and the Palm at that point was really in it’s ascendancy. We also realized that if people were going to use Palm computers with kids in schools, then they needed our software. For example Sketchy, which is a drawing animation tool we developed that allows students to create animations, is not just a paint program, but a tool that can be used as a sequencer. Kids could illustrate how to do long division with Sketchy. They could use this software to demonstrate long division. They would show the math and write English to explain it. Teachers have shared with us that they can teach long division in half the time when we use Sketchy. So we hit something, we hit a nerve that really made a difference with early adopters. At the same time Cathie and I we were doing research in Detroit along with some other folks to look at the impact of handhelds on learning. We had three teachers, each of which had four classes. Two of those classes used Palm computers, the other two classes didn’t use Palms. This was a controlled study, paid for again by NSF. At the end of the second year of the study, once the teachers finally understood how to take advantage of the technology, the children who were in the classes that had the handhelds showed a 13% advantage over the children who didn’t use the handheld, using the same test and the same curriculum. What this study did was confer an advantage in using these devices. It was a difficult study to do and it cost almost $600,000 by the time we were finished with the research. But in the end, we had a control study to support the anecdotal story, which is pretty cool. Today, Cathie and I continue to do research at the universities, publishing papers, writing, because that’s what you do at a university, but also trying to figure out how to make this company into a viable force in K-12. ST: What year was this when you started? ES: We developed the applications in 2000 and then by 2002 we were a small little tiny company. ST: So GoKnow, as a business entity, offers instructional content via the Palm or other handhelds for K-12 use? CN: That was the way it started, but as of the last year handhelds have converged with telephony. While there are still some companies that make standalone handhelds, many of them are now cell phone computers as opposed to simply handheld computers. We are starting to see the implementation of cell phone computers into classrooms. ES: Let’s take one step back. What happened was Palm started to back away from the K-12 market and all of a sudden Dell came into the picture. They offered low cost pocket PCs. We ported our software over to the Windows mobile platform when there was an uptake on pocket PCs. But then, that too stopped because of this idea that no one would want to buy a non-telephone handheld device. Everything was going towards this converged device. Parallel to this was the one-to-one laptop programs as Cathie mentioned earlier. The results from those programs were “They’re not really working.” Why weren’t they working? One reason was there wasn’t enough educational software available for these laptops. A second reason, teachers weren’t receiving any professional development on how to use those laptops in the classrooms. They could show technically how to use the computer, but the bigger issue was how do you integrate the laptop into the classroom. And third, the costs were such that it was not sustainable. You couldn’t keep buying and buying laptops, it just didn’t work. So that laptop thing, it’s still going, but the momentum has clearly died down. ST: I know we had spoken about this before Elliot. That the business of how computers are sold on the consumer level, with upgrades and operating systems that are updated every 18 months or so, seems to work against trying to create really successful learning software because schools purchase equipment that outdates itself pretty quickly. Schools can’t necessarily repurchase again to keep up with whatever the state of the art is in computing. CN: That’s exactly right. We had a school district that we talked to just this week that said they were ordering a device, a laptop, and the hardware was changed three times before they received the device. ST: Well this leads in nicely to my next question. I think it’s clear what the challenges are related to laptops and workstations in the classroom, that there are financial incentives to computer-based businesses that require OS and hardware upgrades. Computer obsolescence seems to occur faster than a school’s ability to pay for upgrades. Do you see similar challenges with handhelds in the classroom? ES: Well, again, let’s take one step back because there is this new opportunity with these low cost, mini laptops that was started by Nicholas Negroponte and the One Laptop Per Child initiative. While GoKnow was going out and selling its handheld software, people would say to us “Why should we buy a handheld? We can spend a $100 and get a whole laptop computer.” We used to say “Well if you can buy a laptop for a hundred bucks, go buy it.” As you know the OLPC device came out around $200. What also happened was that Intel, Asus, and now Dell, all came out with a $300 – $500 mini laptop, and we’re seeing schools moving pretty quickly to buy those laptops. They’re not buying the $1,000 – $1,500 laptops, but the lower cost laptops are an exciting opportunity. Now they still run XP and you still have problems with these devices turning on or off instantly. There are still all kinds of headaches and the operating systems are still complex, but the price point is really low and that’s very exciting. Handhelds are still in the $250 – $350 neighborhood. Double that and you can get a full laptop. On the market today you have this mini laptop movement and then you have these converged devices that have a lot of functionality. Everybody has an offering in that space and the prices for those devices are not unreasonable. So now the question is how could K-12 take advantage of this opportunity. Remember, our study stated that access was the problem. Now it seems that access is no longer the problem. It is within the grasp of schools to give every kid a computer. It could be a cell phone computer, it could be a mini laptop computer. The conditions necessary for computing to have an impact could actually be achieved, and it’s only been in the last 6 to 12 months that that vision has been recognized in the community. But now there’s another problem that has raised it’s head. CN: The biggest single problem now, if children do indeed have access to technology, is the problem of how teachers integrate this technology into the classroom. Up until now, technology is either the focus of the instruction in that it’s an instructional technology class (they’re teaching children about Word and Excel and that sort of thing) or it’s an add on to a lesson (here we’re going to be doing a lesson on the Civil War, let’s look at this website that deals with the Civil War,) but it’s not an integral part of the lesson. We determined that it couldn’t be an integral part of the lesson because there weren’t tools available that easily allowed teachers to create lessons around the technology. There are products like Blackboard or WebCT or Moodle and I can understand why teachers aren’t authoring their lessons everyday in these tools. It’s like asking them to program in HTML. How good are they at that? I would say many of them don’t even know what HTML is, especially when we see elementary education majors who are only required to take one three-hour course in technology. They don’t know the difference between “Save” and “Save as” and we’re going to ask them to create their lessons in something like Blackboard? Well we know that’s not going to happen and so what we did was create what we call the Mobile Learning Environment. The mobile learning environment is a tool that runs on top of Windows Mobile, Windows CE or Windows XP. It allows teachers to easily take whatever applications they normally use, be it Inspiration, or a paint program, or some type of drill and practice program, and it allows them to build a cohesive lesson in a very short amount of time with very little training. ES: What Cathie’s explaining is that schools have existing curriculum that they have to teach. They bring that pencil and paper curriculum to the table and set it down next to a computer and say “How do I take this pencil and paper stuff and integrate it with the technology?” School districts across the country have specific things they have to teach. Some companies try to replace the curriculum through a new computer-based environment. These companies are saying “You adopt this technology, and with it, you also adopt this curriculum.” We feel that this doesn’t work. School districts have existing curriculum they teach with, you can’t tell them to change the curriculum because of the technology. So then the question becomes how to integrate the technology with the school’s existing curriculum. ST: Let’s say that technology and hardware, because it’s coming down in price, is not the issue. The problem then becomes software that attempts not to undo lessons and materials teachers have been preparing in an analogue way for years. Software that tries not to tell teachers to chuck all that they know aside and start anew with whatever this latest and greatest software product tells you to teach. The issue is about providing tools that work in addition to and complement side by side with the teacher’s instructional materials they’ve been using for years. CN: Yes, that’s very well put. ES: If you go to a situation where the computers are one-to-one, where every child has a computer, be it a cell phone computer or a mini laptop computer, then all the learning activities, all the learning resources are on that device. It becomes the conduit then for the curriculum and for the artifacts the student creates. In some sense it does replace or certainly augments the paper and pencil materials. As Cathie pointed out earlier, the problem was that the computer was used as an add on. The major part of the lesson was still done on paper and there might be one activity that you did on the computer but that activity wasn’t integrated with the rest of the pieces of paper. The computer wasn’t playing an integral role to the lesson. But with one to one, it becomes possible for the computer to play an integral role. CN: Which is the way it is in business. Most business people do the majority of their work on their computer. Pencil and paper tends to be an aside or an add on for notes. When we start talking about teaching children 21st Century Skills, teaching them how to use the computer for the bulk of what they do is certainly a 21st Century Skill. ST: Certainly, so long as it’s not just teaching the technical means to do a PowerPoint presentation or write a paper. It’s about the critical thinking that goes on. ST: I’ll come back to that point in just a moment. I’ve heard it expressed by business leaders involved in creating educational materials that handhelds present an opportunity to empower student learning in a way we’ve never before imagined possible, but it could come be at the expense of teacher control. Can student empowerment and teacher control coexist in the classroom? CN: The teachers who are out of control when students have handhelds are the same teachers who are out of control when the students have pencils and paper. I was a classroom teacher for 15 years and back then the threat was that computers were going to come in and replace all teachers. All of the good teachers felt that any teacher who could be replaced by a computer should be. There is always room for and a place for good teachers. In this case the role of the teacher is different. It’s not necessarily a role of handing out the information. You don’t open up students’ heads and dump in the information. Rather, teachers provide direction and contextualize things for students as they do their lessons. Students are not sitting there like little birds waiting to be fed. To create autonomous learners you must contextualize things for students as they find them or as they run into difficulties trying to fit pieces together because you’ve structured the lesson for them. ST: You’re singing my song. One of the things we often say at our organization is that a child is not a vessel to be filled, but a flame to be kindled. What you’re speaking to is how do you create that spark and engage that 21st Century Learner. ES: We saw that spark and the leveling of the playing field when we were working in Bedford-Stuyvesant in New York City with handhelds four years ago. This was when pocket PCs were just beginning to be available to K-12. We would go into these classrooms where children are physically and sexually abused, they live in homeless shelters, it’s 100% free and reduced lunch. This is a very intense school. You bring in these pocket PCs and they could do anything, they could do everything. If you looked at the work and said “Who produced this?” you wouldn’t know that it was a child from Bedford-Stuyvesant. It could be a student from an upper class suburb. The work stood on it’s own merits. The children there were not successful with the paper and pencil. They didn’t like it. It didn’t meet their needs. It wasn’t part of who they were. But when you gave them this technology, it kindled that flame and they then had an opportunity to produce in the same way that the other kids had. It was astonishing to see. ST: So it’s your belief that 21st Century Learning Skills can be addressed properly with handhelds? CN: Yes. The way we learn and what we learn is changing, and that is really the majority of the issue around 21st Century Skills. Children need to learn how instead of what. How do I find this information? How do I determine from this Internet what is valid information? How does this fit into everything else that I’m reading? How does this merge with my textbook? It’s the how. Again, it’s helping the child take the wealth of information that’s out there, assimilate it, and determine what’s a valid source, what’s real information. Photo of 5th grade students from Singapore using computers that are tethered to desks. ES: The 21st Century Skills are about teamwork and the “soft skills” kids gain when working and collaborating together. If you watch classrooms with big desktop computers, the kids are sort of sitting hunched over looking up at the machines. They’re not talking to each other. They’re not sharing. They’re just staring at the screens with headphones on. But when you put mobile computers, handheld computers, in a classroom the kids are looking at each other, talking to each other, putting the handhelds in front of each other’s faces. They’re working together. They’re actively engaged in teamwork. It’s a completely different flow in the classroom. 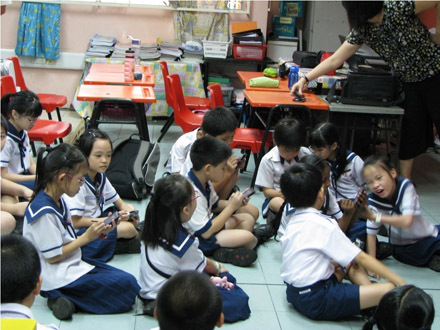 Photo of 3rd grade students from Singapore using mobile computers in a conversational manner. The smallness, the immediacy, the ease of use of these handheld devices is exactly what is needed to support the 21st Century Skills, where your dynamic workgroups change over the course of a day. If different children work with different kids on different problems, no problem! That’s what happens with these handheld computers because you’re not tethered. CN: We have some excellent photos of that when we were in Singapore last month. We were working with researchers there at the university in Singapore. They’re implementing a project where they will follow third and fourth graders who are using cell phone computers, pocket PCs, for learning activities in the classroom. We observed great diversity in the entry points into lessons, even on the part of second graders. One such lesson was on prepositions. Teachers gave them pocket PCs and sent them out into the school yard, over to the Koi pond, into the central office in groups of three to take pictures that were illustrations of the preposition “in”. You know, the fish are in the pond, the basketball is in the basket, things like that. They gave them a series of prepositions they had to photograph and then they came back to the classroom and wrote sentences explaining their pictures. Then they shared their pictures and the sentences that went along with it. We saw eight different ways that students could complete a lesson. In the end, they all got the assignment done but they were all able to do it their own way, the way that suited them best. ST: That really speaks to the empowerment for students. One of the things I wonder about for a greater acceptance of handhelds in the classroom; do you have any thoughts or insights into what professional development should be in place to help this succeed? ES: When companies that really understand the role of technology in the schools work with the teachers, they realize it’s not a one shot deal. You can’t just go in and only show the teachers how to use the computers. That was the failure of those laptops programs, the lack of ongoing professional development with the integration issue. We stress this when we work with a school district. There are districts that say “Well we don’t have the money and we really can’t do professional development” and Cathie and I just sort of grimace because we know there’s going to be trouble. The teachers and administrators are not going to understand how to use the technology. When the bumps happen, and there are always bumps, they’re not going to know how to deal with those bumps. Professional development is not just having experts help the teachers, it’s also having the teachers talk to each other and work together with children to get over those bumps. ST: It’s great that schools can invest in the technology, but just buying the equipment and any additional software to benefit the instruction is only half the solution. CN: That’s exactly right. It would be like buying a new car. It really helps if someone walks you through all of the features of the new car. Otherwise you’re driving but you’re not really taking advantage of all of the bells and whistles that a new car has. A lot of districts think that if their teachers know how to use a computer that this skill translates into knowing how to integrate it. In fact that’s something that they don’t teach in school. Most of the colleges of education don’t have tools to be able to teach prospective teachers how to do that. Teachers who have been out there in the field certainly don’t have that information. ES: So if we could summarize. One of the first challenges we saw to getting technology to have an impact on the kids was the access problem. Today we feel that the access problem, while it’s hasn’t gone away, is certainly addressable in a scalable, sustainable way. The next problem is this issue of how do you integrate existing curriculum with the technology. That requires professional development, it requires software that helps the teachers in doing that integration so the technology scaffolds in some sense so teachers can create coherent, cohesive lessons. Professional development also scaffolds the teachers in creating coherent, cohesive lessons that integrate the technology. Now that we have access addressed, we have to deal with this integration problem, and it’s integration with existing curriculum. People say, and I’ll be honest I’m guilty of it too, that we need to have a new curriculum. Technology enables us to do new things. That’s easy to say but it doesn’t address what schools have problems with today. The curriculum will change but everything is not going to change on day one. You have to start where the teachers are, with their existing curriculum, and help them understand how to integrate it using tools like what Cathie suggested along with professional development. ST: If I could branch off of your comment there. Classrooms have the potential to see beneficial change as a result of technology. Today there are so many different ways of interfacing with these new technologies, be it classroom technologies like Tablet PCs or Smart Boards or consumer technologies like the Nintendo Wii or Apple iPhones. Are you seeing any technology trends that are important to watch in terms of learning? ES: I think the smallness issue is really important. The cell phone computer is not simply just a smaller laptop computer. We’ve spent years learning how to design interfaces for laptop computers. You can’t just use all those same techniques, scale it back a little bit, and apply then to cell phone computers. Designing for mobile machines with a small screen is different than designing for 15 – 17 inch screens. We have to think about what is the essence and what’s really important. It will require a change in how we think about designing our software, how we design our web pages. Companies that simply take their 17 inch or 15 inch technology and just try and repackage it for the small screen will lose out. People will not buy that solution because it is not effective on a small screen. ST: That seems to be a common occurrence with publishers, that is if they have a successful program in one media format they simply port it over to another. And that is not the best solution for addressing mobile computing or any other kind of platform for that matter. ES: It might make instant business success but they won’t have business success with that simplistic model. We’ll see. The proof’s in the pudding. It’s too early to say. That’s our opinion, we’ll see. ST: Well that’s true. One of the things that I worry about with Smart Boards is people are just porting all of their book based content into static PDFs to be displayed on Smart Boards. There’s nothing engaging there about that solution. CN: Right. Children are simply watching something bigger. We were in Mexico and we saw that Mexico had adopted the Smart Boards in all the classrooms. At one meeting we attended, they demonstrated how they were going to be using the Smart Boards in the classroom. A teacher had a book opened, displayed on the Smart Board, going through the lessons with the book on the Smart Board. It was just a bigger book, the children are still being passive learners. They simply watched her as opposed to engaging with a technology that fits them, moving up and around, it’s a completely different learning environment. ES: This was a very powerful learning experience for both of us. Here is a country trying to move into the 21st century. They were going to equip their classrooms with all these expensive, electronic whiteboards. All they were doing was the same thing that they had done with books in the past and that wasn’t particularly interesting to the kids. Displaying the book a little bigger is not going have any impact whatsoever. ST: Andy Warhol had a saying, “If you can’t make it big, make it red.” So maybe that’s the next step. CN: That’s not to say that some people aren’t doing innovative, imaginative things with Smart Boards, because they are. ST: Very true. I don’t mean to be down on Smart Boards. I’m excited by them but I get disheartened when I see its use in such a way that it’s really not forward thinking to benefit the instruction with the great medium that’s available to them. ES: Historically, new technology mimics old technology until you figure out how to take advantage of the new. A classic example is when the movie camera came out people simply photographed the theater because that was the thinking of how you viewed theater. Then Hollywood came along and defined this experience as a new genre, a new medium, one that can tell a new kind of story. It wasn’t immediate. It took a while to figure it out. We work folks at SRI and they are doing some wonderful things with whiteboards, with the clickers, they’re really trying to go beyond the obvious things that you could do with those devices and be much more engaged, much more imaginative. ST: Let me ask both of you; whose work are you watching these days? Who do you think is doing neat work with technology and learning that would really benefit students everywhere? ES: Outside the education world, I think the folks who are trying to develop apps for mobile computers, people who are grappling with how to use multi touch, how to display information, those are the folks that we’re looking at. The range of location-based apps that people are coming out with now, with GPS built in, those are very, very provocative. We’re going to see new interface conventions generated. Phone companies have opened up access to lots and lots of applications, not just the three or four products that come with the phone when you buy it. You can download and install whatever applications you want. Cell phones are full blown computers. Cathie is intentional when she uses the term cell phone computers. Just like you have desktop computers and laptop computers, you have cell phone computers. The emphasis is on the computing part, that it can enable all kinds of applications. What do you build, how they work, ease of use; these devices have to be ready to go and intuitive from the moment someone picks them up. That’s a real challenge. ST: I sometimes wonder if the difficulty with technology in the classroom is in how it is defined, semantically. A cell phone in the entertainment industry is portable entertainment or portable gaming device. That terminology doesn’t work in the classroom. I like how you’re framing the conversation, that these are cell phone computers, they’re not cell phones, they’re not entertainment devices, they’re devices made for learning. CN: Yes. We had a discussion about this just yesterday, about what a cell phone computer should be or not be. In Singapore they’re not enabling voice. They’re only paying for data plans for the third and fourth graders. They will have 24/7 access to the Internet which really levels the playing field because it doesn’t make any difference if you have an Internet capability at home or not. You can still have access to all of the information, no matter where you are because of your cellular capability. But someone in a parents group yesterday said “Do you really think it would make a difference, and what difference would it make, if you did indeed give them voice in addition to it?” We have moved away from the term acceptable use policy of devices to what we call responsible use. As educators, we believe that we need to make all of these users responsible for what they do with their technology. It’s not that we’re dictating what is acceptable and what isn’t. It’s about being responsible and maybe that means we do give them voice. We also encourage schools to let children put a few tunes on the mp3 player, or to let them download a game or two because we want the device to seem personal to the children as opposed to it just being another school device. If it’s personal to the child, then they’re going to take better care of it, they will make sure that it’s charged, because is theirs. It’s their personal device. What’s important to you are those things that are personal to you. ES: We see a trajectory with this issue of one-to-one computing. The entire notion of one-to-one is going to change. The term is inappropriate. It’s a dominant term now because it comes out of the laptop world. It still focuses on the technology as opposed to what the kids are going to do with the technology. I think over the next few years, the notion of one-to-one as a term will disappear. What’s going to happen is that it will be a given that all the children will have a computing device. It probably is going to happen faster than most people think. Right now, a large percentage of schools in the United States, ban cell phones. But once this dam breaks, when schools see that kids are already bringing computers to school and schools don’t have to pay for those computers, the light bulb within administrators will light up. Administrators will begin to notice that one child brings a Motorola, another brings a Nokia, and yet another brings an iPhone. The solution? You just put a layer of software on top of the phone that makes all those non-homogeneous devices homogeneous with respect to the teacher and the learning activities. Just like a Dell and a Sony and a Gateway. They’re different computers. You put a layer of software on top of them and now they’re all the same. That’s the same idea that will happen in the cell phone computer world. And when this happens, we think it’s going to happen very quickly. Not in five years, more like two to three years. This entry was posted on Monday, January 19th, 2009 at 7:00 am	and is filed under Audio Recordings, Classroom Tech, Handhelds/Mobile Computing, Interview. You can follow any responses to this entry through the RSS 2.0 feed. You can leave a response, or trackback from your own site. Hi Scott. I loved this article. What a monumental task. Being a technologist in the thick of social media and Internet marketing, I’m always struggling to get the bigger picture in front of my clients. Innovative technology needs innovative implementation. Just like you’ve stated above with the Smart Boards – people in the workfoce today not the problem-solvers our children will be because their learning experience was so linear. I would say that its going to be much easier to get that expensive new technology into the classrooms than it will be to get the schools to change their old teaching habits. Its not just the schools, but the parents and communities who need to understand the potential benefits. Walls of fear need to be broken down about how impersonal computers are. In fact, they enable us to become infinitely more social and engaged. I wrote about what Intel is doing with innovation last Fall. There’s an amazing video that shows us how we may be using new technologies in the not-to-distant future.